Are you having problems retaining clients? What about continuity in your income? competitive pressures to deliver results at competitive rates in less time. successfully, while dramatically increasing profitability. Set up your own custom-branded eFitnessTracker Powered Web Site to help advance your business to the next level. Boost client retention and motivation through 24/7 access and communication  never lose a client again! Extend your website services with tools such as an exercise library, workout wizard, food search, fitness analysis and more! JOIN TODAY and you will put the power of the Internet to work for you! Online training and online trainer tools provide value to you and your clients...Click here to find out how! Enter your name and email to receive our free newsletter packed with fitness business tips. You will immediately get a copy of our Fitness Business Checklist, start learning from our Online Marketing Guide, and receive your PROMO code for a FREE month trial of a Business or Tools Account! There are 23 different layouts to choose from with different color options on sign up. To limit visible layouts by color, unselect the colors from Color Options on the right. 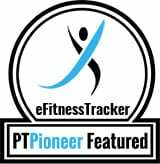 Client Logins - each client has their own login to their personal profile, calendar, workouts, favorites, etc. Additional content in the libraries such as more workouts, fitness plans, meals, etc. or see the Fitness Analysis in action!